Today two space rocks named Asteroid 2012 QG42 & Asteroid 2012 QC8 will pass by earth and while they do so. They would be at closest they can get earth today. Experts suspect since their birth in early days of formation of solar system these objects have been wandering around in some or other form. 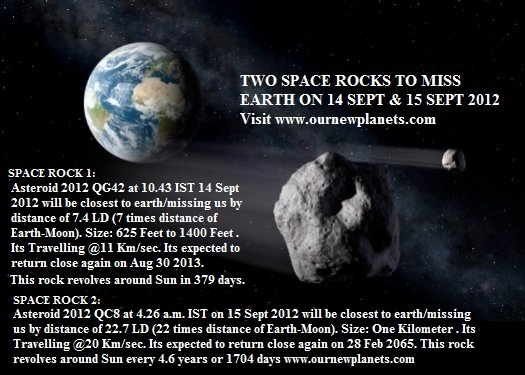 "Asteroid 2012 QG42" with size from 625 Feet - 1400 Feet will pass by earth today 14 Sept. At 10.43 a.m. IST. it will be closest it can get to earth this year. Traveling at speed of 11 Km/sec it will miss us by distance of 7.5 LD or 7 Times the distance of Earth & Moon. Importantly this rock revolves around Sun once in every 379 Days and it will be again this close to earth in next year on 30 Aug 2013. Further another Huge Space Rock named as "Asteroid 2012 QC8" will also passby Earth 14/15 Sept. At 4.26 a.m. IST on 15 Sept 2012 this Spacerock will be closest it can get to earth. What is more interesting is the size of this Space Rock which is ONE km in size and it presently traveling @20 Km/Sec. This rock will miss us by 22 Times the distance of Earth & Moon. Please Click Here Various interesting articles we wrote in the past during such similar passes. Particularly read the Question & Answer Format posts for more clear information.